I have to confess that I was a little nervous when I heard the programmed keyboard on the first track to Wine of Heaven. I've long suspected founding guitarist Pier Gonella, for all his abilities on the neoclassical guitar, of being a closet techno aficionado, and the ever-so-slight use of autotune on the vocals of Giorgia Gueglio, a lady who has to be close to the bottom of the list of singers who need an autotuner, only increases a listener's first-time dread. But this isn't the first time that Mastercastle has flopped on a song or two and then delivered the goods everywhere else. So it is with Wine of Heaven. The first track, Drink of Me, is as underwhelming in its entirety as it is in its first impression; in fact, I'm pretty sure its melody has been reused in a couple other albums. Following that false start, however, things take a turn for the better. The mid-tempo tunes remain the same, simple beats and rhythms where Gonella and Gueglio take center stage, but if you're not listening to the album for neoclassical guitar shredding or industrial-strength female singing, you probably shouldn't be picking a Mastercastle album up in the first place. On those two fronts, it delivers as solidly as usual, even containing a cover of Yngwie Malmsteen's Making Love, not quite as technical as Malmsteen's version, but with a sturdy vocal performance. The rhythm riffs have an even more electronic tone to them than usual that make them sound like they were programmed rather than, as I imagine, played by Gonella, but he lays that aside when he begins shredding, and that is as dramatic as ever on Space of Variations and Hot as Blood. 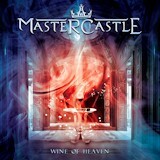 The greatest difficulty in listening to past Mastercastle efforts has always been Gueglio's sharp-edged vocals, which have all the magnificence, as well as the softness and humanity, of a razor blade made of solid diamond, and which induce migraines in untold numbers of listeners by the end of an album. This time somebody turned down her mike in the mix a bit, and now it's easier to appreciate the beauty of her voice, a natural match for Gonella's crunching rhythm work and solo shredding, than it was on the last album. She adds a particularly high level of emotion on Black Tree's Heart, a power ballad in the style of Lovin' Me from 2011's Dangerous Diamonds. Mastercastle have only made slight tweaks to their formula here, though softening Giorgia Gueglio's vocals definitely makes Wine of Heaven more listenable than its predecessor. For some the band continues to be an acquired taste, but existing fans will find nothing to complain about.